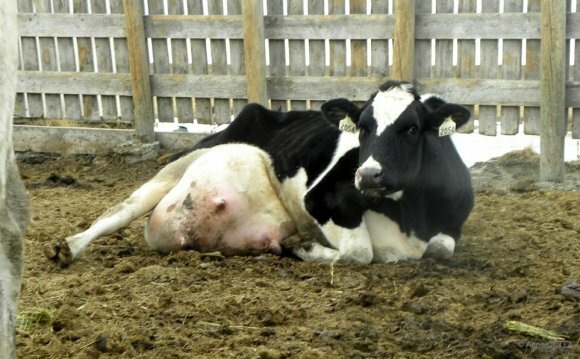 In 2007, the average cow in the dairy industry was forced to produce more than 20, 000 lbs. of milk in one year — more than double the milk produced 40 years before. Breeding cows for this unnaturally high level of milk production, combined with damage caused to the udders by milking machines, contributes to high levels of mastitis, a very common and very painful swelling of glands of the udder. Arguing that it improves hygiene, dairy producers cut off cows’ tails, called “tail docking, ” either by placing a tight rubber ring around the tail until it falls off or by cutting it off with a sharp instrument. Each method causes chronic pain. Cows use their tail to swish away flies and can suffer immensely during fly season.